The year is half over! Amazing! It’s gone fast! June was a very busy month, with visitors and lots of time in the gardens. As you can see from the photo, Elderflowershave been dried for teas. Also strawberries, peas, snow peas, broccoli, aspabroc and black raspberries are in the freezer. Various kinds of beans, pickled beets, and strawberry jam have been canned. The lavenders are ready to harvest, and I can begin pickling this week because the cucumber vines are going crazy! Most of the gardens have now been planted, even the Cutting Garden! It was a lovely, lovely month to be a gardener! June is National Dairy Month, National Rose Month, National Candy Month, National Fudge Month, and National Turkey Month. I hope you took time to celebrate some of these special treats. Wabash Herb Fest: Saturday, Aug. 18. Plants, garden décor, fairy items, lots of herbal products and more.Free admission.Food on site.Speakers throughout the day. Paradise Spring Park, 9-3:00. Wabash, IN. Herb Society District Gathering: Friday, Aug. 24- Saturday, Aug. 25. 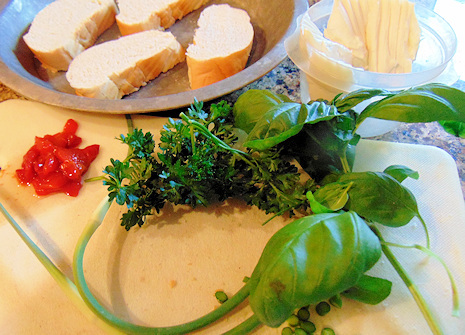 Plans are underway for a really special herb gathering in Indianapolis. Mark your calendar and plan to attend. There will be fantastic gardens to visit, terrific speakers, herbal treats and continental breakfast provided by the local herb group, silent auction, door prizes, and lots of herbal information and networking, plus a couple of make-it/take-it crafts. So, plan to come celebrate “Red, White and Blooms!” You do not have to be a HSA member to attend. More details in upcoming newsletters, but mark your calendar now. 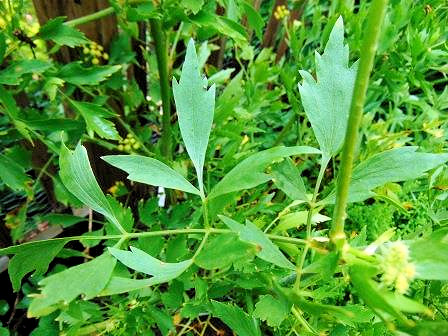 One of the early risers in spring, lovage (Levisticum officinale) has been prized for centuries for its pretty foliage, long hollow stems, and luscious celery flavor. Said to be a native of the Mediterranean regions, it is perfectly hardy here in Zone 5. Early colonists brought it to North America as a valuable culinary herb and medicinal plant. 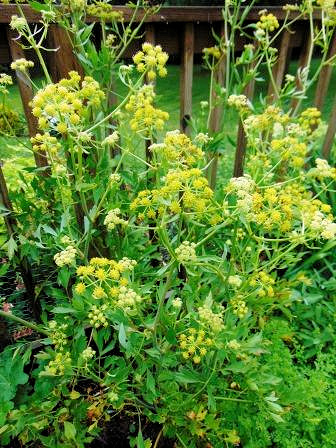 A perennial, lovage is very easy to grow in full sun or it can be used to fill that slightly shady corner where other herbs aren’t happy. If it is grown in full sun, be sure that it gets adequate moisture to keep the leaves green and producing during the hottest days of summer. I also give it a dose of manure tea or diluted fertilizer in mid-summer to keep it thriving. The plant can get as tall as 5’, but mine generally stays about 4’. When it is mature, it will produce dill-like clusters of small yellow flowers that will eventually become brown celery-flavored seeds. Mine are ready to harvest right now. However, unless I need the seeds, I generally cut the faded flower heads off so the plant will use its energy to produce more leaves. For quick production, plant a plant. Like most perennials, growing from seed takes patience. Sow the seeds in early fall. Because it has a fleshy root, the plant does not divide as well as many other perennials. The leaves and stems can be used fresh in any recipe that calls for celery. That’s a real blessing to the increasing number of people that are allergic to celery. Use them in salads or on canapes, especially the young spring leaves. The leaves can also be dried to use in soups, stews, casseroles and sauces in winter. Lovage leaves may have a slightly stronger flavor, especially as the season progresses, so use lightly at first and add more if required. If the stems get too strong a flavor, blanch them by dipping them in boiling water followed by a quick rinse in cold water. Pick the outer leaves and stems at will, but allow the center to grow undisturbed. 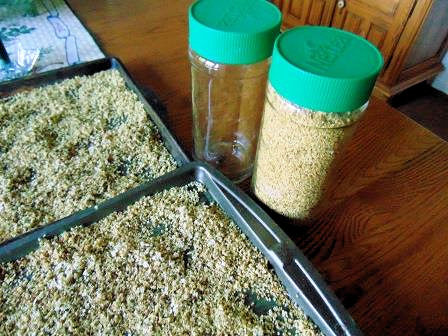 The ripe seeds can be dried and added to savory breads. In England, the seeds were often coated with sugar as a confection. The leaves or seeds can be added to tea blends and in cordials. Traditionally, the hollow stems have been used as a straw for Bloody Mary Cocktails. The plant was used for a variety of ailments such as ague, intestinal disorders, and sore joints. Lovage seeds have been used in infusions as a facial cleanser and also as a deodorant. Steep a ¼ c. seeds in a pint of boiling water for an hour. Strain and add to a warm bath or use as a foot soak to help eliminate foot odor. The seeds have also been used as an ingredient in potpourri, and fresh seeds steeped in brandy were used to settle an upset stomach. The roots were often harvested and infused to reduce water retention or to aid rheumatism They were also sometimes pickled. Lovage roots should not be used during pregnancy or by those with kidney problems. *It’s Official! Gardening is a “Force for Wellness!” We’ve known this in our hearts for years, but now a survey concludes that gardening “strengthens concentration and memory, generates happiness, reduces community crime, improves energy and reduces stress!” So, don’t just sit there, get out there and plant something! When the flowers of German chamomile are fully open, it’s time to harvest. You can purchase a special “rake” specifically made for the job if you have a tremendously large patch, or palms up slightly spread your fingers between the stems, lift up and pop the flowers off into your hand. Spread them on a screen and place them in an airy room, out of direct sunlight or high heat. The flowers dry in three or four days. Store them in an airtight tin in a cool, dry place. Remember only the flowers are used for tea or cooking. Although there are two types of chamomile, generally the taller German variety is used for teas, etc. because it has abundant flowers. It is an annual that reaches about 2’ in height, with a ripe-apple fragrance. One of its folk names is “Scented Mayweed.” The single white daisy flowers are about the size of a dime with a bright gold center. Right now, mine is ready to harvest, but I will allow some flowers to remain so the plant can self-seed in the potager’s interior border. If weather permits, there will be another crop later in the summer. 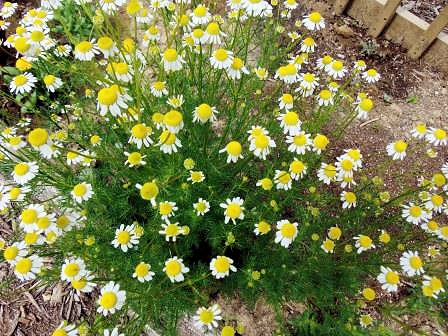 Chamomile will grow well in any sunny location with average soil. The low-growing, mat-forming Roman chamomile has few flowers, and they have several rows of petals instead of just one row. Although it is a perennial, I have not found it to be hardy in Zone 5. In warmer climates, it is often used as a ground cover, or it makes a fragrant seating when planted on a bench. Both types of chamomile have a long history of medicinal use, especially as a quieting tea that aids sleep, upset stomachs, painful menstruation, urinary infections, and as a mouth wash. Externally, it has been used as a hair rinse for blondes, as a treatment for eczema, and an eye wash for tired eyes. The flowers are also distilled and the resulting essential oil is used in the cosmetic and pharmaceutical industries. It is quite expensive and is a lovely shade of blue due to the azulene found in the flowers. While I’m not a big fan of chamomile tea by itself, I like it blended with mints or lavender and recognize its calming effect. I love chamomile tea bread and make it often. 1. Watch for Japanese Beetles! Since the soybeans were planted late and not blooming yet, these destructive pests are hitting the roses and other garden plants hard. Tap them into a bucket of sudsy water. PLEASE don’t use Sevin as it clings to honeybees’ furry bodies and when they return to the hive, everyone dies! 2. If you haven’t trimmed your iris foliage, do it NOW. If you see small round spots on the leaves, the dreaded iris borer has laid eggs there. When the little larvae hatch, they will eat their way leaving a streak or trail down the leaf and into the corm, where they will eat and grow into an ugly 1” long worm almost as big around as a pencil. They will happily munch the corms all fall, destroying your beautiful irises. 3. Dead-head coral bells, coreopsis, phlox, Shasta daisies, and other perennials to encourage the plant to produce more blooms. 4. Continue to keep a keen eye on hollyhocks and roses. There is a tiny, tiny worm that will skeletonize the leaves overnight. Spraying with insecticidal soap after each rain (being sure to get the undersides of leaves) will keep them at bay. 5. Check tall lilies (the Asiatic and Oriental types) to see if they need staking before their heavy flower heads open. 6. Dead-head lambs ears NOW, or they will self-seed everywhere! 7. Cut the flower buds off garlic plants as soon as they form. They are a gourmet delicacy, raw in salads or lightly sautéed as a side dish or in stir-fry. If you don’t cut them off, the plant will use up loads of energy trying to make flowers and seeds rather than making a nice big bulb! 8. Cut off lemon balm and put it in a sun tea jar, by itself or with other herbs and mints to make a delicious tea. Adding a leaf or two of stevia will sweeten it nicely. The plants will soon grow a new batch of foliage. This will keep balm from self-seeding everywhere. You can also dry it for therapeutic baths. 9. Now that it’s getting hot, move containers of nasturtiums, mint, violas and pansies into semi-shade to protect them from the hottest midday sun. It’s time to harvest the scapes that form on garlic, so the plant will use its energy to make larger bulbs. We’ve grilled lots of them, which makes the flavor mild, by simply spraying them with olive oil, sprinkling them with salt & throwing them on a hot grill. 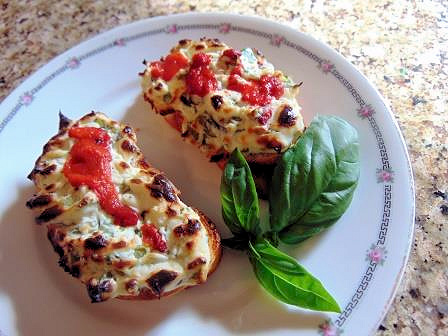 However, when I have a bit more time, we love this appetizer! 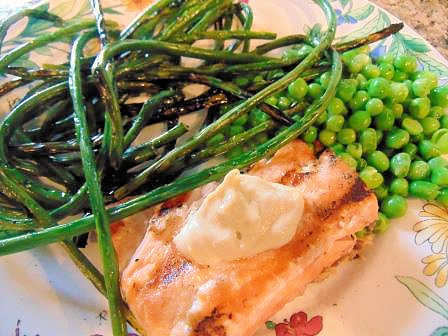 Combine 4 T. cream cheese (room temperature) with 2 finely chopped garlic scapes (about 1 heaping T.); 2 tsp. finely chopped parsley; 2 tsp. finely chopped basil and a generous grind of black pepper. Spread on 4 slices of crusty bread. Top with a strip of roasted red pepper or a slice of tomato. Broil for about 8 minutes, until cheese begins to brown nicely. Serve immediately. And here's a photo of grilled garlic scapes. Give them a try, they are delicious! Hope you have a wonderful 4th of July! The summer is whizzing by, so be sure to take time to observe the beauty of plants, harvest the beneficial, fragrant herbs, and be dazzled by the bounty of flowers in your garden. Life is short; make the most of it!